﻿﻿﻿﻿﻿﻿Growing plants to grow more fish in reservoirs. re-evolution of fisheries management is taking root. Rather than applying a top-down approach to fisheries management by stocking fish, biologists are going bottom-up by stocking plants and putting in fish attractors to create habitat, sort of an “if we build it, they will come” approach. The movement to improve fish habitat in reservoirs falls on particularly fertile ground in Texas, where hundreds of constructed reservoirs dominate the landscape in a state that has only one natural lake of significant size but more inland water than any other state (except Alaska). 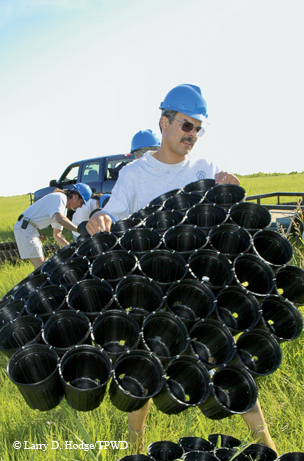 Dave Terre, chief of research and management for the Texas Parks and Wildlife Department’s Inland Fisheries Division, is a leader in the nationwide movement to improve fish habitat in reservoirs. Reservoirs are unnatural systems, often lacking in native aquatic plants. Damming a stream and flooding the terrestrial habitat around it creates a bizarre submerged waterscape of dead trees, brush, old roadbeds and whatever else was built on the land. Decaying vegetation releases nutrients into the water that jump-start the fishery and maintain it for a time, but reservoir fisheries typically decline over time as the flooded vegetation degrades. Stocking fish into this alien world creates a fishery, but one not likely to be sustainable or able to reach its full potential. The importance of plants in reservoirs is difficult to overstate. Plants do much more for reservoirs, their watersheds and the people who live there than just provide for the needs of fish. 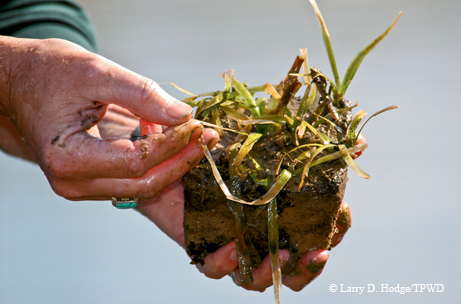 Native plants also help fight invasive nonnative species such as hydrilla. Partnerships are key to the effort. 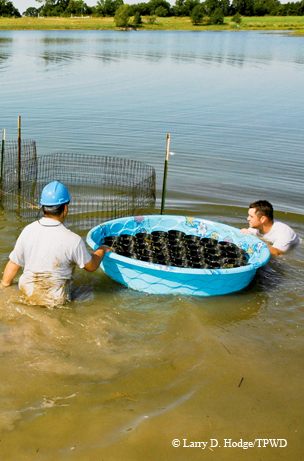 Ott and Webb have been in the forefront of efforts to introduce native aquatic plants into Texas reservoirs, following the lead of the U.S. Army Corps of Engineers’ Michael Smart, head of the Lewisville Aquatic Eco­system Research Facility. “When Dr. Smart suggested that we should stock native aquatic plants for the same reasons we stock fish, we wanted to kick ourselves for not having seen the obvious,” Ott smiles. “You have to ask yourself when you stock fish: Where will they live and what will they eat? Using plants from Smart’s Lewisville facility, Webb and Ott experimented on seven Texas reservoirs that represent a cross-section of conditions across the state to develop a list of native Texas plants that will survive under a variety of conditions. They also experimented with techniques to aid survival of these plants under reservoir conditions different from those of natural lakes. Like Smart, they decided that a founder-colony approach works best. Plants are raised in a nursery in plastic pots before being transplanted to a reservoir, where they are enclosed in a wire cage to prevent being eaten by turtles, fish or land-based herbivores. Over time the plants spread outside the cages. After this first phase, biologist made plantings in Lake Bellwood, a former water-supply lake for the city of Tyler, to demonstrate what they had learned. Stocking plants in reservoirs throughout Texas presents a tremendous challenge. The first hurdle to overcome is establishing a reliable and affordable supply of plants. Nursery facilities have been set up at the Texas Freshwater Fisheries Center in Athens, at the Lake Waco wetlands and on San Jacinto River Authority (SJRA) property at Lake Conroe. The latter furnishes the model for how the Friends of Reservoirs process is envisioned to work. Involvement with the project brought public exposure that helped increase Seven Coves membership from 17 people in 2005 to nearly 70 at present. Seven Coves Bass Club is now the first organization in the nation to be granted chapter membership in the Friends of Reservoirs. Other projects carried out by the Seven Coves Bass Club include a grass carp removal tournament with the assistance of the Texas Bow Anglers Association, the installation of more than 700 cinder-block-and-bamboo fish attractors and the introduction of native plants along miles of shoreline. The fish attractors and the plants are two sides of the same coin. “The spider blocks are the temporary habitat; the aquatic plants will be the permanent habitat,” Gunter says. Funding projects through the Friends of Reservoirs allows local groups to raise money under the organization’s 501(c)3 umbrella, making it easier to attract corporate donors. All funds raised by a group are earmarked for the group’s projects and are not shared with anyone else, which helps maintain local control. It’s often said that “what happens in Vegas stays in Vegas,” but with water, what happens in a watershed ends up in a reservoir. Friends of Reservoirs projects will coordinate programs targeting land management practices in watersheds to improve the quality and quantity of runoff into reservoirs. The Friends of Reservoirs program makes it possible for everyone interested in a lake to help pull the plow. Anglers, boaters, area property and business owners, water utilities and consumers and anyone involved in water-based industries will benefit from improved water quality, control of invasive aquatic species and reduced maintenance and operation costs from lower rates of erosion and sedimentation.